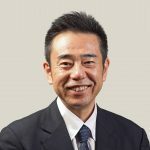 Dr. Hashimoto specializes in general machinery, fluid machinery, heat exchangers, optical fibers, and control systems. He conducted research on heat transfer accompanying phase changes (boiling, condensation). He has experience in consulting and sales of optical measuring machines, research and development of next generation nuclear reactors, making use of the supercritical carbon-dioxide (CO2) loop, and production and distribution of nonferrous metal powders. Dr. Hashimoto has also lived in Germany on an overseas assignment.